In case you haven’t seen this, those of you whose work didn’t make the cut at The One Show still have hope. 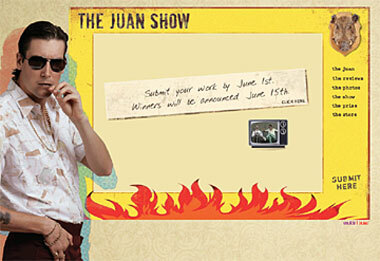 You could win a Gold Toothpick at The Juan Show. Under the direction of Donald Davis Jr., aka "Don Juan," aka "The Juan," the show’s rules are simple. Just send Juan some of your advertisements if you want him to look at them. You can send them one of two ways, though only one way is identified: by email. "Just make sure you don’t send me more than five of those meg things," he advises. The site contains lots of background on Juan, who became an expert on advertising when he stayed home from school for 17.5 weeks after an construction accident. Snoop around a little bit more and you discover he’s actually the byproduct of viralists at GSD&M in Austin.